Steak entree at Geordie's Restaurant inside the Wrigley Mansion, Phoenix AZ. This blog is fond of championing fine dining in historic, architecturally significant and cultural venues worldwide. The bon vivant-ness of breaking bread in such remarkable settings is in a word indescribable. In today’s recap, we visit the Wrigley Mansion in Phoenix, Arizona, where the management and chef at Geordie’s Restaurant goes beyond menu convenience for tourgoers to offer first class fare. More on the menu later, but first a side dish of history. The Wrigley Mansion, now a landmark site was originally commissioned in the late 1920s by chewing gum icon William Wrigley Jr. Completed in 1932, as a 50th anniversary gift to his wife, Ada, the mansion from atop a 100-ft hill, offers visitors a 360-degree views of the mountains and the sprawling city below. Architect Earl Heitschmidt of Los Angeles designed the home at a cost of $1.2 million, in a combination of architectural styles including elements of Spanish, California Monterey and Mediterranean styles. It has 24 rooms, 12 bathrooms in more than 16,000 square feet. Much of the extensive tile work was shipped to Phoenix from Wrigley's factory on Catalina Island. 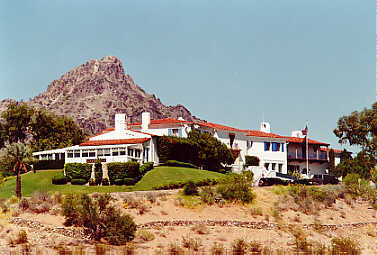 The mansion is nearby to the Arizona Biltmore Hotel, which Wrigley owned at one time. The Wrigley’s maintained other residences in Chicago; Philadelphia; Lake Geneva, Wisconsin; Catalina Island; and Pasadena, and used this, the smallest of their houses, for only a few weeks a year. William Wrigley died in 1932, shortly after its completion. After being sold by the Wrigley family in 1973, it changed hands several times. In 1992, as the city of Phoenix was planning to tear it down to make room for condos, the late meat-packing scion Geordie Hormel and his wife Jamie fell in love with the property and purchased it on the spot. Together they restored it with the intention of sharing its inherent magic with everyone. 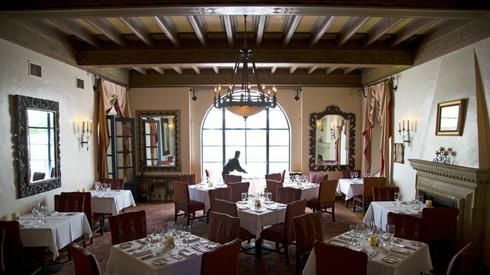 Today Wrigley Mansion is a Phoenix “Point of Pride”, a top destination for weddings and special events, as well as the popular restaurant Geordie’s Steak restaurant and lounge offering lunch, dinner, happy hour and Sunday brunch. On this one visit, our entrees of fish and steak by Chef Jason Diaz were superb as were the side dishes. Stealing the show from the steaks and other entrees was the chef’s fresh mushroom soups. Geordie’s serves Arizona-raised Cedar River Farms prime beef. CEO Paola Embry and General Manager Ben Sinon have developed an award-winning wine list. With more than 500 different wines, Geordie’s wine list is one of the largest in the Southwest.